O2 Academy Bristol is the latest Academy Music Group (AMG) venue to receive a complete new audio system design, specified and installed in conjunction with Adlib. AMG divisional manager, Helen McGee and O2 Academy Bristol’s technical manager, Mickey Spillane worked with Adlib’s John Hughes and Roger Kirby to specify an L-Acoustics KARA PA system. The final design was based on offering all visiting artists a high specification, in-house system, as with other recent new audio installations within the Group. The main auditorium, at 24m-wide and 14m-deep, has an audience area split over two levels. The balcony, while offering excellent vantage points for a standing audience, places them relatively close to the stage, making this an interesting space to fill evenly with sound. The positioning of the main PA arrays was revised with the assistance of UK Rigging, commissioned to co-ordinate the installation of new steelwork in the roof, optimising the weight loading and bringing the main left and right arrays in to around 11m apart, which is a lot closer together than the original PA hangs. 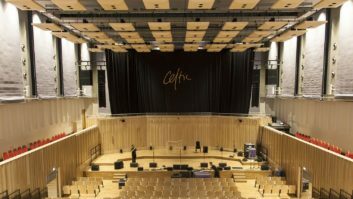 These main hangs each comprise of seven L-Acoustics KARA speakers in optimum positions to cover the downstairs audience, along with low frequency support from four SB18’s – two hung at the top of each KARA array. Eight SB28 subs, configured four a side, have been positioned beneath the main hangs and set into the stage, allowing prime arrangement without any compromise to audience stage sight-lines. Low frequency delivery was also important, as O2 Academy Bristol hosts regular club nights. Two areas to the extreme left and right of stage now receive sound coverage via a pair of flown L-Acoustics ARC WIFO loudspeakers – an ARCS Focus on the top and an ARCS Wide at the bottom. A pair of ARCS Focus elements are positioned in the centre of the venue, acutely angled downward to cover the near-field audience area in the centre of the front-of-stage barrier. A further pair of ARCS Focus’s are flown directly above the front lighting truss to give coverage to the audience on the section of balcony directly above the mix position. A total of 10 Adlib AA1214 12in delay loudspeakers already at O2 the venue have been re-purposed, with a pair relocated to give coverage to the side balcony positions, just wide of the main arrays. “We all went to great lengths to establish the main priorities for O2 Academy Bristol, and the nuances of the environment, and listened to those who work there everyday,” said Adlib’s Roger Kirby. “We knew we had to fully-spec the system to facilitate the sheer variation of trade, from production-heavy club nights to the biggest international touring artists, and in all cases the feedback has been fantastic,” said O2 Academy Bristol’s technical manager Mickey Spillane. Two DiGiCo SD12 consoles were specified for FOH and monitors, a decision based on the rising popularity of DiGiCo on touring riders and the hugely successful installation of DiGiCo in other Academy Music Group venues in London (the O2 Forum Kentish Town) and the North East (the O2 Academy Newcastle).